Now is the time to upgrade to 13x7 reverse wires with 175/50/13s. Umm....How about uhh NO lol. Even if I wanted to I couldn't. Cobalt SS models can't have rims smaller then 18's. I'm sticking with my stocks and having Jeremy do the Hydro dip for them. Just got to find some spares till I can get them done lol. 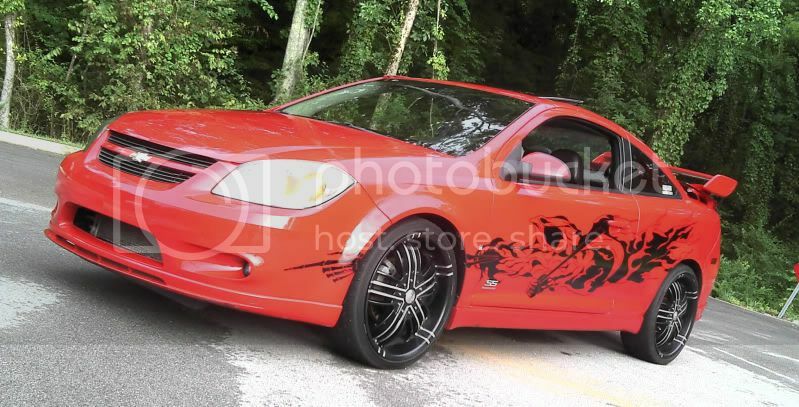 Cobalt SS models can't have rims smaller then 18's. That just means you would be a trend setter when you pulled it off. I used to roll reverse wires on my '84 Corolla. Nothing more fun than hitting a mud puddle and creating a fountain of mud for the car behind you, and all over your doors, and the pulling effect you get when all that water hits your wheel well inside your wheel. Good times. Rims still for sale. I need to get rid of them. They are sitting at my shop taking up room. Make me some offers .